Discount tickets to Drake Vs. Lil Wayne’s upcoming tour began preview release yesterday and sales have rapidly climbed to the top of trending concert queues, said Marta Ault at online discount ticket marketplace BuyAnySeat.com. The rap superstars’ 31-date co-headlining tour hits Noblesville, Tinley Park, Saratoga Springs, Hartford, Cincinnati and Clarkson after opening at the Darien Lake Performing Arts Center in Darien Center, New York on August 8, 2014. 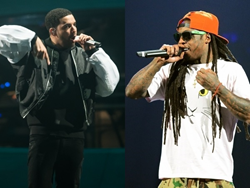 Canadian rapper Drake, aka Drizzy Drake, with Young Money boss Lil Wayne, aka Weezy, will be hip hopping the country this summer on a 31-date trek from New York to L.A.
There’s some heavy rap on tap this summer. Canadian rapper Drake, aka Drizzy Drake, will be teaming up with the Young Money boss Lil Wayne, also nicknamed Weezy, for a 31-date coast-to-coast trek. After rattling the rafters with their opener at the Darien Lake Performing Arts Center near Buffalo on Friday, August 8, 2014, the happening hip hoppers hit the road to perform in 30 more cities, including New York, Chicago, Atlanta, Houston and Los Angeles. “Discount tickets have been trending at the top of sales queues since they went on presale yesterday,” said Marta Ault at online discount ticket marketplace BuyAnySeat.com. “That’s why we’re proud to be able to offer fans the most comprehensive and continuously updated selection of discount concert tickets online, with a worry-free guarantee to protect their purchase," added Ault. The two rappers have a big catalog of songs they've performed together, including their best known collaborations "Right Above It," "She Will," "Love Me," "The Motto," "Miss Me," "Trophies," "HYFR (Hell Ya F---ing Right)" and "Forever". Fans can also expect to hear Drake perform his hottest hits, ranging from 2009's "Best I Ever Had" and 2010's "Find Your Love" to recent singles "Hold On, We're Going Home" and "Started From the Bottom". Adding to the tour buzz: Lil Wayne recently broke Elvis Presley's Billboard record for most Hot 100 chart appearances in 2012 with 109 songs -- and counting -- such as "Lollipop," "Got Money" and "How to Love." After the opener in Darien Center, the rap duo rips into Noblesville, Tinley Park, Saratoga Springs, Hartford, Cincinnati, Clarkson, Burgettstown, Forest Hills, Camden, Mansfield, Holmdel, Virginia Beach, Bristow, Charlotte and Atlanta in August. To date, no opening acts have been named. Initial ticket prices range from $35 to $125.50. To shop for discount Drake Vs. Lil Wayne tickets, visit BuyAnySeat.com. To save even more, enter coupon code "BAS2014" during checkout.